Sleeping on bunk beds with our siblings is something that we have all enjoyed our childhood. Bunk beds were more fun than the usual ones and that’s why still kids want bunk beds in their bedrooms. But as we grew up there is no more option to have fun with bunk beds, right? 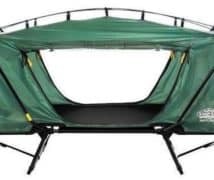 Actually no, you can have that same old fun of bunk beds with the Disc-o-bed while camping. The Disc-O-Bed is basically camping bunk bed cot which can be shared by you and your camping partner. For many people camping is the best way to get away from the hustle life. To add more fun to this camping you need a Disc-o-bed. Rather than going for a normal double size cot it is more interesting to use a bunk bed cot. After all, who doesn’t love bunk beds? To get a better idea about these bunk bed cots, we have come up with this Disc-O-Bed Review. There are different types of Disc-o-bed available in the market. In this Review, we are going to talk about the Disc-O-Bed Large with Organizer one. Before we get into the details, let’s just see the basic measurements and material specifics of this Cot. Q: What is the height of the Disc-O-Bed when two cots are stacked? Q: Are the organizers removable? Q: Do we need anything extra to set it up? Q: What is the setup time? The Disc-O-Bed has gone through quality engineering and you will see it just after you open it from its package. It sits in a well-secured carrying bag. After laying out different pieces of the cot you will see there are 8 discs that have given this cot bunk a unique look. 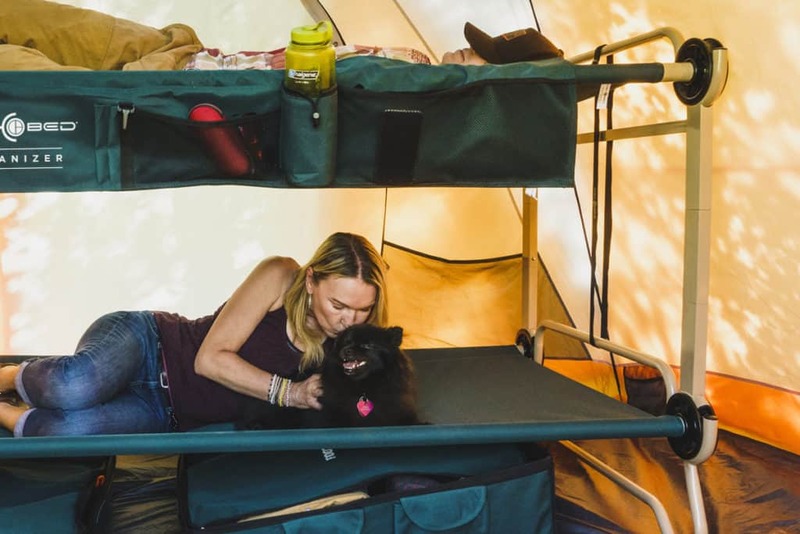 The bottom part of the cot does not dig into the bottom of your tent. Therefore, it won’t cause any damage to your tent. The dimension of the Disc-O-Bed is 34x16x11 inches which are pretty good for most of the people. The best thing about this Disc-O-Bed is that it can be converted into a couch also. For that, you just need to unhook the front discs from the upper bunk and then left them in the legs of the lower down cot. We have really liked the design of this Disc-O-Bed and we think it makes sure you have a pleasant sleep. There is no requirement to use different complicated tools to assemble this Disc-O-Bed. After you have slipped the product with the help of two steel bars you will be able to attach all the discs with it. There is no bar in the middle of the two beds, so you don’t have to worry about anything which will come awkwardly in your back and will make uncomfortable. 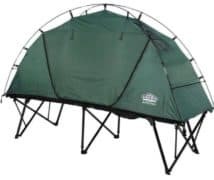 This Disc-O-Bed is easy to set up and also very comfortable which can be used for multiple nights. The Disc-O-Bed is made of the sturdy steel frame. For this reason, it is obvious that it will weight heavy. This bunk cot weights around 63 pounds which is hefty but you cannot actually expect a double to weigh less than this. Most of the other bunk cots also weigh more or less same as this one. Though it weighs heavy, it ensures that this Disc-O-Bed is strong enough to hold weights of 2 people. The product suggested that it has a weight tolerance of 500lbs. for every single bed. This large Disc-O-Bed comes with 2 organizers. Each of the organizers hangs from each cot, which means for 2 cots, 2 separate organizers. These organizers are large enough to store your camping equipment like the headlamps, maps, books, water bottles or any other camping essentials. Moreover, these organizers have zipped sleeves and open pockets which have these easily accessible. With this Disc-O-Bed you don’t have to leave your cot again and again to get your products. These are now just a hand away from you. 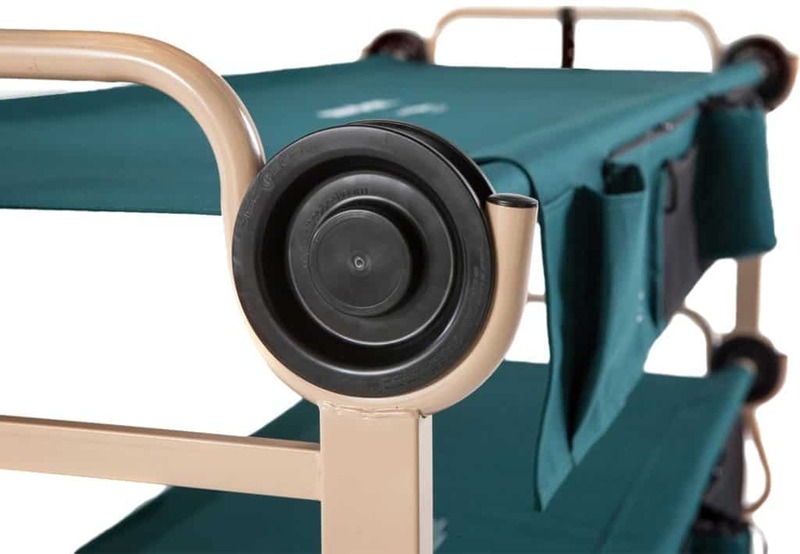 The solid construction of the Disc-O-Bed has provided this cot bunk a great durability. Even the carrying case that comes with the bunk cot is on heavy duty along with a nice carrying handle. The steels of the cots are powder coated and made of anti-rust steel. Therefore, you don’t have to worry about much of this Disc-O-Bed’s durability. 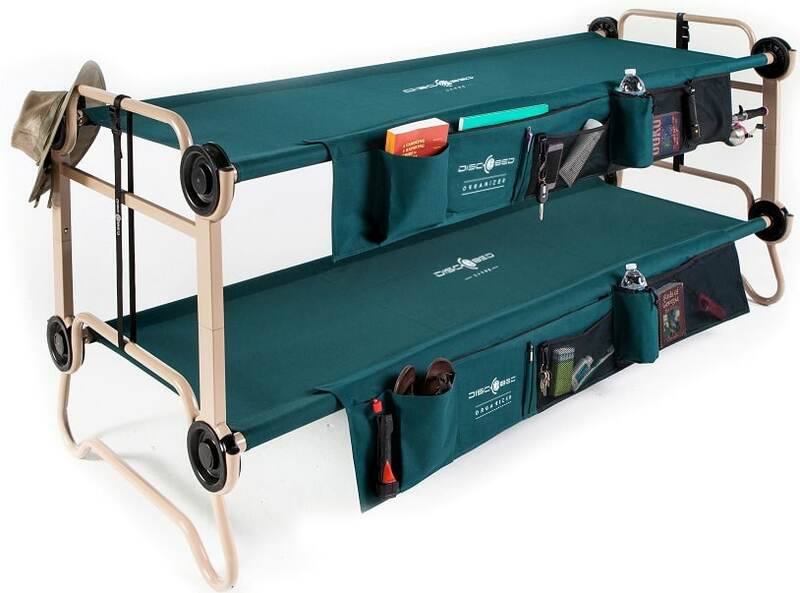 The Disc-O-Bed Large with Organizers comes in at a very high price. However, many times through the year they offer different sales offer where you can buy it at a less price. Now, at first the price will seem a bit high, but we think this a great value product. This is not a simple cot that you have used previously. It is durable and strong enough to carry two people effortlessly. Moreover, you can actually turn it into as a coach. There are organizers to keep your things sorted out. The Disc-O-Bed also includes carrying bag and stack adapters. So you can understand that you are actually getting a lot from a single product. Getting 2 functional cots at this price is actually reasonable; as if you buy two separate cots then it will cost you higher. Simple to assemble and disassemble. Wide enough for an adult person. Really heavy to carry at camping. It has a slight chemical smell. A: The height will be around 32 to 34 inches. A: Yes, you can easily remove them. Those are attached with Velcro. A: No, everything comes with the Disc-O-Bed. A: To set the whole thing it will take 10-15 minutes. 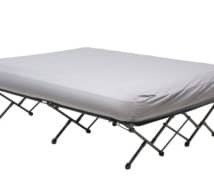 So we have found that this Disc-O-Bed has got durability, strength, space and mainly good value of money for which we think you should invest in it. Yes, it is little tough to carry to different places as it is a bunk cot. 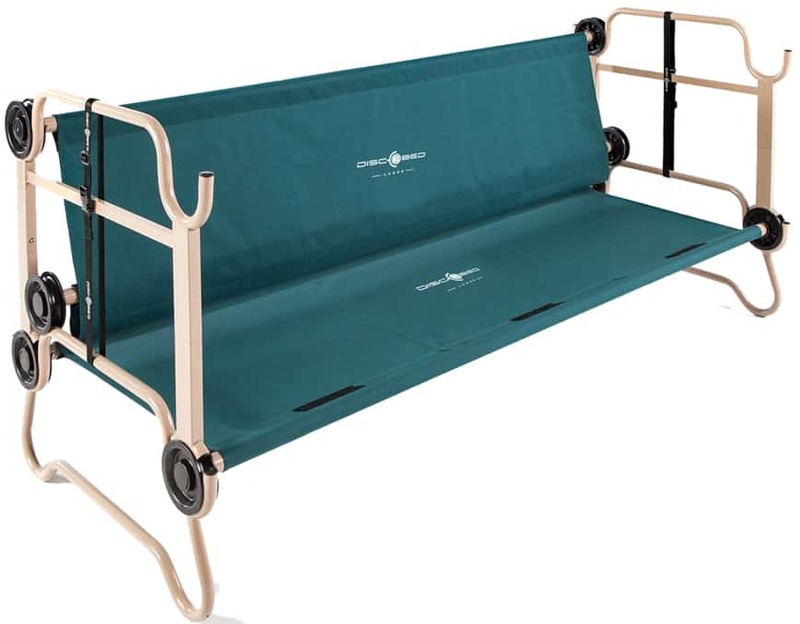 Apart from this problem, the Disc-O-Bed with organizers is a high-quality cot which you can use for several camping experiences. This is a product that your kids will also love to have at your backward.